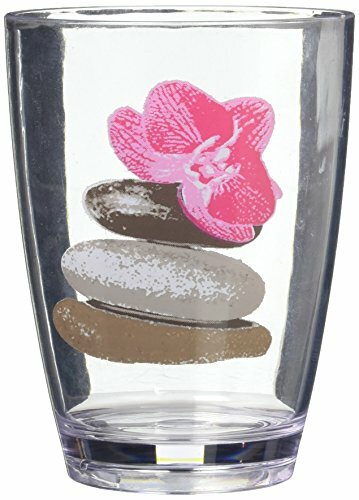 This printed tumbler spa for bathroom is in clear acrylic with pebbles and flowers motives. This tumbler is a lovely accent for any bathroom and its shape is flared upward with a diameter of 2.95-Inch and a height of 4.13-Inch. Wipe clean with damp cloth. Color grey and Pink. Accessorize your bathroom countertop in trendy style with this charming tumbler! complete your decoration spa with other products of the same collection. Imported. Accessorize your bathroom countertop in trendy style with this charming tumbler!